The big shocker of the book – you might want to sit down for this – is the belief that the Porter’s Five Forces and Kraljic models are no longer well suited to the goals and objectives of a modern competitive enterprise. Michael and Peter are out. Their strategic models, which were revolutionary in their time, overly emphasize the need to build power relative to one’s business partners. Before you feel too badly about this change in circumstances, it is fair to point out that the models were introduced in 1979 and 1983 respectively. So, 37 and 33 years ago. They had a pretty good run, but it does seem logical that we should revisit our guiding principles every 3 – 4 decades or so. Enter ‘Sourcing Business Models’ from Vitasek and team. There are 7 Sourcing Business Models, defined by the authors as “the combination of two critical concepts: the contractual relationship framework you use to work with your supplier (transactional, relational, investment based) and economic model you use (transactional, output, or outcome based). Because the encompass a wide range of approaches on the sourcing continuum, the models and outcomes vary significantly. More importantly, there is no one fixed center point – such as power – that leads to homogeneous results across the models like you might have with either Porter or Kraljic. If there is a downside to Sourcing Business Models, it might be that procurement has too long been overly dependent upon models in general. We had a strategic sourcing process, until we follow it like a checklist and it became tactical. There is a risk that this is replacing one model addiction with another, but it is still an improvement. And if any change comes from this, perhaps it will be the lesson that we should revisit the models we use every 5-10 years rather that 30-40. In fact, one of my favorite quotes in the book, from Luke G. Williams, executive director of innovation and entrepreneurship and professor of marketing at New York University’s Stern School of Business, is “Disruptive innovation is not just about following a process. It represents a mindset – a rebellious instinct to discard old business clichés and remake the market landscape.” If we assume that the authors agree with this sentiment, we have to think that they fully expect to see their models evolve or be replaced as circumstances require. 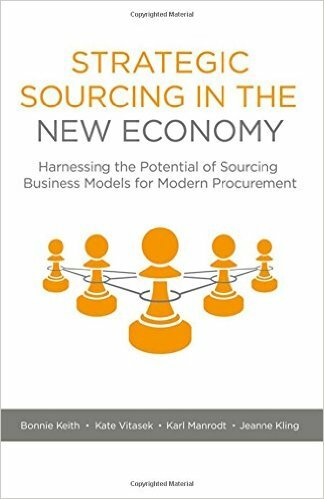 Like the other books involving Vitasek, Strategic Sourcing in the New Economy is chock full of case studies – really good ones, where the companies are both identified by name and recognizable. An additional resource that I particularly like are the ‘Recommended Reading’ textboxes throughout the book. Not only do they make it easy to connect with additional information on each topic, their availability calls attention to the need to move on and do your own research to make the models and concepts your own. If you're interested in more, listen to my interview with Kate Vitasek on BMP Radio.